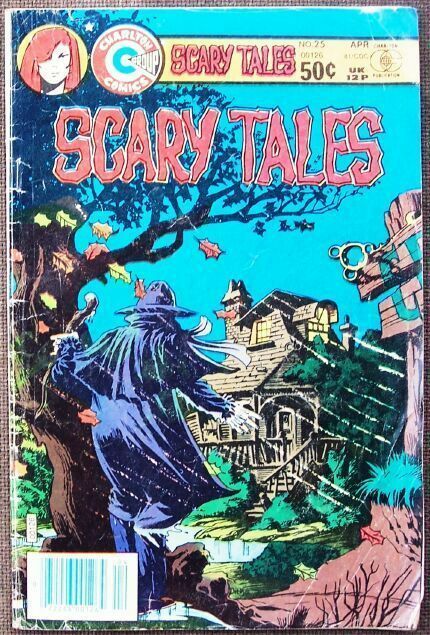 Charlton Comics Group - Scary Tales Vol 7. No. 25 - April 1981 Good readable comic book. Two stories 1. Scorpio Curse 2. The Vampire's Bride 3. What's Inside Roger? Vintage ads including a few for Body Building Scary Tales Vol. 7 No. 37, April 1981, reprint from 1976 Condition: Acceptable reading copy, not of collectible quality Natural age toning No missing pages. Spine edge roll and wear Cover creasing and a few pages inside have creased corners Some light water staining Former owner had cut out one small figure on one page, not affecting story or writing. Shipping: US buyer to prepay sale amount and shipping of 5.00 USD, add 50 cents per additional comic purchased. Canadian buyer your shipping will be 5.00 USD, add 50 cents per additional comic purchased. International sales welcome, shipping will be 7.00 USD, add 50 cents per additional comic purchased. Payment can be made by Paypal, Bank Check or Money Order, or if from the USA, an US International (pink) Postal Money Order. Canadian buyers will have the option to make payment in Canadian dollars, a conversion will be provided for you. Any questions, please e-mail. Will combine sales where possible to lessen postage. Please check out my other booth items.